I really don’t know what to call this. 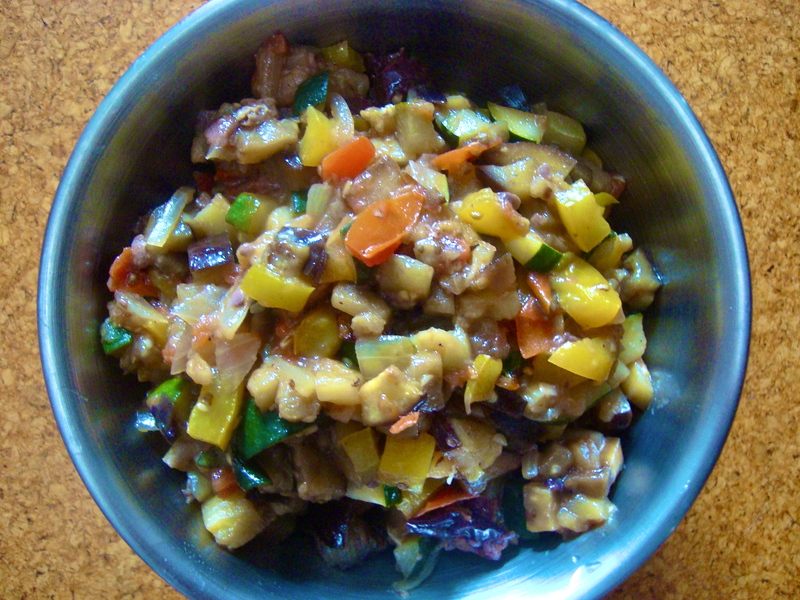 It’s not really caponata, which is an amazing Sicilian dish, kind of a cold, fried eggplant-heavy salad with celery, capers, tomatoes and olives. But it’s not too far off, either. It’s a simpler, dumbed-down version that requires no eggplant desalting or frying, and no adding of vinegars or sugar, no thinking or measuring or brain power. 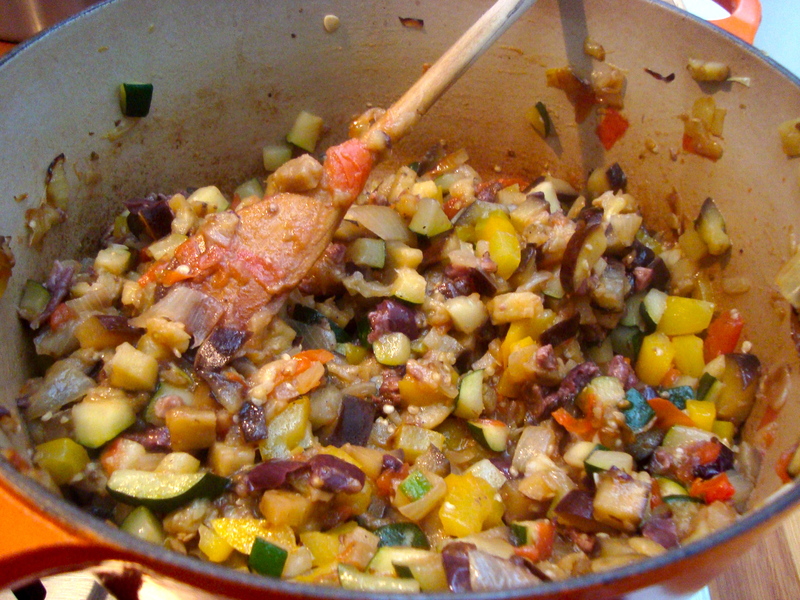 It’s just vegetables – eggplant, tomato, zucchini, pepper, onion and olives – chopped and cooked down in olive oil. 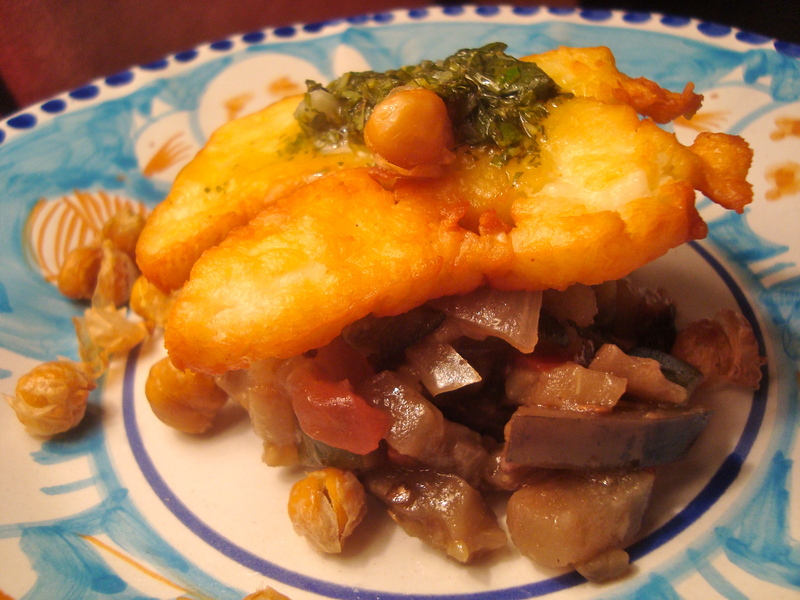 The result is a flavorful side dish for fish, topping for bruschetta, accompaniment to fried halloumi (see below), filling for a savory tart, sandwich condiment, or dip. I originally made way too much of it as the filling for that weird quick bread (which, by the way, was a major hit at last night’s dinner party despite all my negative negativing), and have since used it in a myriad ways. I’m sure it would keep for a while in the fridge, but you’ll probably use it before you have a chance to find out. Hate zucchini? Leave them out. This is beyond versatile. Makes about 2 1/2 cups. Generously cover the bottom of a pot with olive oil and place over medium heat. Add the onion and cook for 5 minutes, then add the rest of the vegetables (except the olives). Cook, stirring occasionally, for about 10 minutes, or until all the veggies are soft but not mushy. Add the olives, cook a couple more minutes, add salt to taste, then remove from the heat.